The Haines Center Receives 2001 "New Good Neighbor Award"
BURLINGTON COUNTY, NJ --- Whitesell Construction Company, headquartered in Delran, NJ, has been awarded the New Jersey Business & Industry Association's (NJBIA) 2001 New Good Neighbor Award for The Haines Industrial Center, a 700-acre warehousing and distribution complex spanning Burlington and Florence Townships. 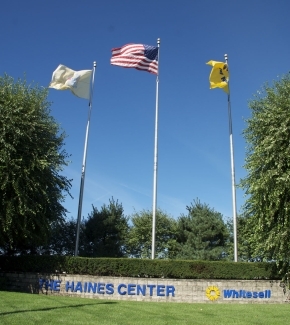 The Haines Industrial Center was one of 12 "New Good Neighbor" awards presented by NJBIA at its 41st annual awards luncheon in Iselin, NJ, June 5th. The Association sponsors the New Good Neighbor Awards competition to recognize those organizations that have enhanced the business environment within the State of New Jersey by creating new, or renovating existing commercial properties. Awardees are determined by an independent panel of judges who evaluate the economic benefits, job creation, architectural merit and community involvement associated with each nominee. The Haines Industrial Center was nominated for this year's award by Joseph D. Foy, Sr., mayor of Burlington Township, who cited the Center as one of the key projects providing a catalyst and northern anchor for a multi-township strategic plan that is revitalizing the Route 130 corridor. "As an industrial complex planned to have more than 3,000 permanent jobs, the Center will be a primary force for priming the local and regional economic engines,” Foy wrote. The municipal official noted that Phase I development of the Haines Center, which commenced in late 1998, had already created over l.5 million square feet of new, state of the art warehousing and distribution space, resulted in the movement of two new enterprises to Burlington County and produced over $1 million in new ad valorem taxes. Additional considerations which secured a New Good Neighbor Award for the Haines Industrial Center included its creation of several hundred construction and permanent jobs for Garden State residents and Whitesell’s sensitivity and protection of the environment during the development process. At the Center named after the late William C. Haines, a former apple farmer and State legislator who promoted New Jersey industry while respecting its environment, the natural habitat of the surrounding Delaware River wetlands and its tributary streams have been incorporated into the overall master plan. Mayor Foy also observed that executives of Whitesell Construction were strongly committed to community service. Specifically cited in the nomination were Richard J. Cureton, executive vice president and architect of the Haines Industrial Center, who serves as Chairman of the Family Y of Burlington County, Company Chairman Thomas Whitesell who is a Member of the Board and major fund raiser for Family Services of Burlington County, and Company President Robert Richards who is a Member of the Board of Virtua Health Services. Fronting U.S. Route 130 and Dulty's Lane, just two miles south of the Exjt 6Aof the New Jersey Turnpike Extension to the Delaware River Bridge, the Haines Industrial Center is the largest commercial real estate development to be initiated in Burlington County since the late 1960s.